(SANTA ANA, Calif.) – January 18, 2019 – The Board of Directors of The All-American Boys Chorus (AABC), today announced the appointment of Genevieve Macias as its new chief executive officer. Macias brings a combination of non-profit arts management as well as corporate communications to the new position. She will be leaving her current dual role as vice president of development and communications of the Long Beach Symphony and executive director of the Foundation for the Long Beach Symphony, where she oversaw all revenue for the professional symphony orchestra. Macias was responsible for leading the Long Beach Symphony out of a substantial deficit and succeeded in accomplishing five straight years of surplus budgets. She also currently serves on the Executive Board of Directors of the Association for California Symphony Orchestras and has held positions at Orange County’s Pacific Symphony and as a brand marketing senior account executive for Burson-Marsteller. The TAABC choristers have sung before some of the nation’s most prestigious audiences -from U.S. presidents to well-known celebrities, and they have performed with some of today’s most successful vocalists including the Pentatonix, Sarah McLachlan, Josh Groban, David Benoit, and Taylor Hicks. They have also worked in collaboration with local organizations including Disney, the Pacific Symphony, and the Pacific Chorale. (SANTA ANA, Calif.) – September 11, 2017 – The All American Boys Chorus invites boys 8, 9 and 10 years old to be “AABC Shadows” and experience what it’s like to be an AABC chorister on Saturday, September 16th from 8:30 am to 1:00 pm. Shadow Day is free and will take place at AABC Headquarters at 1801 E Edinger Avenue, Santa Ana. Artistic Director Wesley Martin states that “Shadow Day is an ideal showcase for interested boys and parents to see our choristers in action. This exciting visit might be the beginning of a wonderful journey that sees boys walk away from the AABC in a few years as fine young men, inspired with vision and determination and leadership instilled through a program of musical excellence.” AABC staff members and parents will be on hand on Shadow Day to answer questions and provide information. To date, the AABC has released six albums and performed to standing ovations in concerts worldwide. 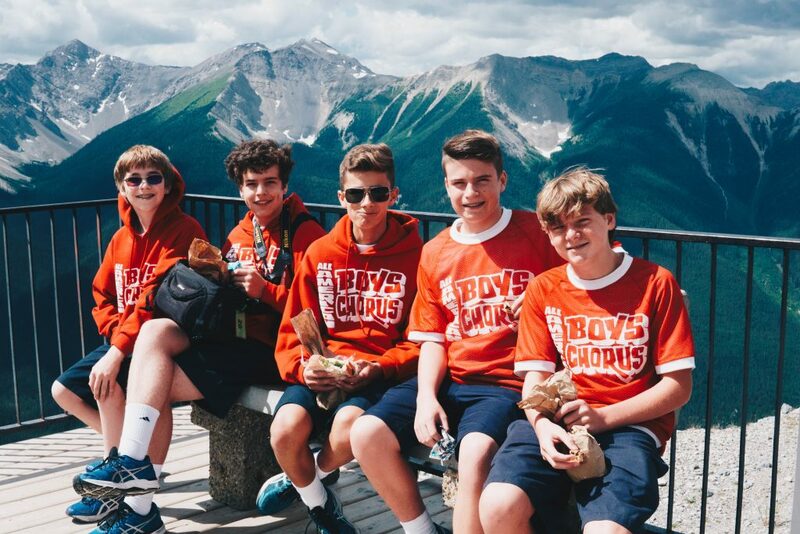 This summer the Chorus’s concert tour included performances in Washington State, and in the Canadian provinces of British Columbia and Alberta. The AABC’s choristers have sung before some of the nation’s most prestigious audiences—from U.S. presidents to well-known celebrities, including the Pentatonix, Sarah McLachlan, Josh Groban, Tony Bennett, and Taylor Hicks. There have also been artistic collaborations with Disney, the Pacific Symphony, the Los Angeles Philharmonic and the Pacific Chorale. The mission of the All-American Boys Chorus is to empower and give voice to boys from diverse backgrounds to build self-confidence, discipline, leadership skills, and realize achievement through the transformative power of music. Celebrating its 47th anniversary in 2017, the All-American Boys Chorus believes strongly in community involvement, and has performed for more than 50,000 school children in Southern California and on 50+ concert tours. For more information on the All-American Boys Chorus, call (714) 361-3920 or visit www.taabc.org. (SANTA ANA, Calif.) — September 5, 2017 — The All-American Boys Chorus (AABC) is hosting its annual Fall Gala on Saturday, November 4 at 5 p.m. at the Hilton Hotel in Costa Mesa. This year’s “Hooray for Hollywood” gala event will feature the presentation of the AABC Great American Award to Captain Jim Lovell, Mission Commander of Apollo 13. The evening will also include live entertainment by the Boys Chorus, a VIP reception with the honoree, a gourmet dinner, and silent and live auctions. Funds raised at the Gala will support the All-American Boys Chorus, where boys (ages 8 to 15) from diverse backgrounds receive music education from a professional staff, as well as mentoring and training in life skills that build self-confidence, strengthen self-discipline and promote achievement through the compelling medium of music and vocal performance. 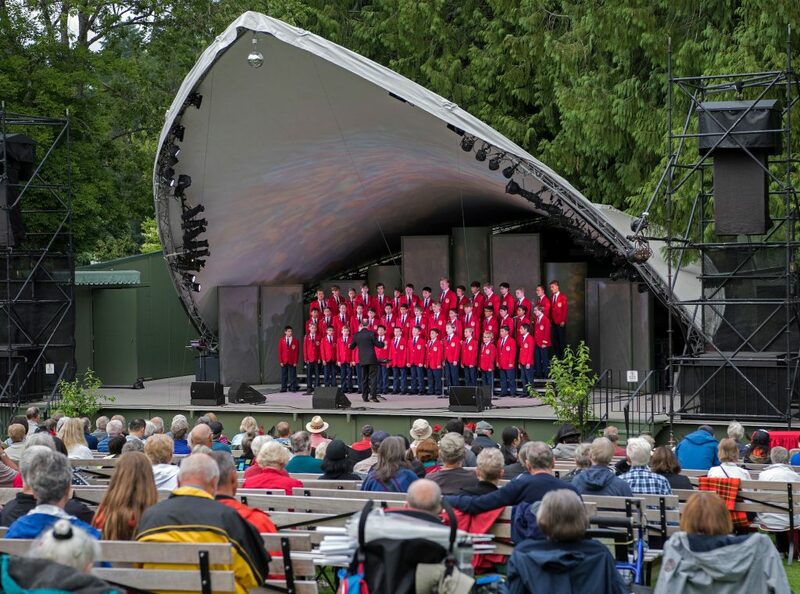 The Chorus has recently returned from a summer concert tour to Canada that included performances at the Butchart Gardens in Victoria, and in Banff and Jasper in the Canadian Rockies. The All-American Boys Chorus Great American Award is presented to individuals and organizations exhibiting positive, extraordinary and lasting contributions to the world, our nation and our community. This year’s recipient, Captain Jim Lovell, mission commander of Apollo 13, is receiving the American Inspiration Award for extraordinary service, work and achievements, and for inspiring young people to pursue their dreams and follow their ambitions. COSTA MESA, Calif. — The United States Naval Academy Men’s Glee Club will perform on Saturday, March 11, 2017 at 7 pm at St. John’s Lutheran Church, 185 S Center Street, Orange. Admission is free, but a freewill offering will be taken. Information may be found at www.stjohnsorange.org or by calling (714) 288-4431. The men’s Glee Club is the most highly acclaimed of the Naval Academy’s musical organizations and has achieved national prominence as one of America’s premier men’s choral ensembles. Recent appearances on network television include The Kennedy Center Honors (CBS), The Today Show (NBC), The Early Show (CBS), Christmas in Washington (NBC and TNT), and Good Morning, America (ABC). The ensemble has been seen performing in New York’s Carnegie Hall and Avery Fisher Hall, San Diego’s Copley Symphony Hall, and Washington’s Kennedy Center. The USNA Men’s Glee Club is directed by Dr. Aaron Smith and accompanied by organist, Monte Maxwell. The All-American Boys Chorus, a non-profit organization, utilizes music as the medium to transform boys lives with programs that teach life skills, impart self-discpline, and build self-esteem. The Chorus is committed to community involvement, and has performed for more than 60,000 school children through its acclaimed music education programs. AABC choristers have sung before some of the nation’s most prestigious audiences—from U.S. presidents to well-known celebrities, including Josh Groban, Kristen Bell, The Pentatonix and David Benoit. There have also been artistic collaborations with the Disney Company, Pacific Symphony, and the Los Angeles Philharmonic. For more about the The All-American Boys Chorus, visit www.taabc.org. COSTA MESA, Calif.— Vocal Point, the award-winning male a capella group from Brigham Young University has produced a new music video set for release on May 5, 2015. The video features a new and moving arrangement of “Homeward Bound,” and was filmed and recorded on March 28th, the day after the group’s sold-out concert in Newport Beach in collaboration with The All-American Boys Chorus. The Oak Canyon Nature Center in Anaheim served as the locale. 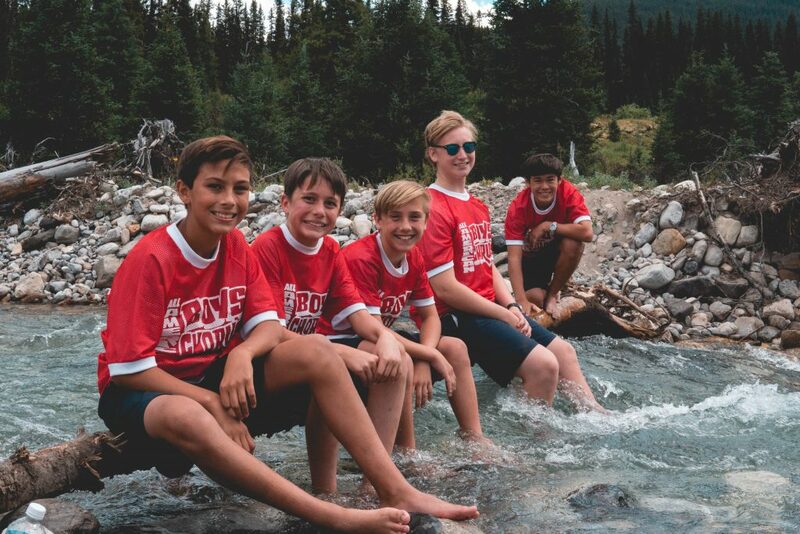 Vocal Point and The All-American Boys Chorus first met 3 years ago when the world-renowned Boys Chorus traversed Utah on their Rocky Mountain concert tour and met with members of Vocal Point to explore the popular world of contemporary a cappella singing. Preview audiences have remarked on the video’s powerful and universally positive message, leading to its release in the week prior to Mother’s Day. Vocal Point received two CARA Awards for the best Contemporary a cappella album of 2014, and was a nationally featured finalist on NBC’s “The Sing-Off.” The All-American Boys Chorus is a professional ensemble based in Costa Mesa. In addition to collaborating with Vocal Point, the Chorus also just recorded the definitive “A Charlie Brown Christmas” album with Grammy nominated pianist David Benoit for release this coming holiday season. Later this year the Chorus will perform at the Kennedy Center in Washington D.C. as well as embark on a concert tour throughout Japan. COSTA MESA, Calif. — The internationally acclaimed All-American Boys Chorus (AABC) is hosting its annual Fall Gala on Saturday, November 1, 2014 at 5:00 p.m. at the Hilton Hotel in Costa Mesa. This year’s “Wings of Freedom” gala event will feature the presentation of the AABC “Great American Awards” to Major General William Lyon USAF (Ret) and Apollo 17 Astronaut Captain Eugene A. Cernan USN (Ret) for their positive, extraordinary and lasting contributions to the world, our nation and our community. The evening will also include live entertainment by the Chorus, which has recently returned from a concert tour to Canada and the Pacific Northwest, a VIP reception with the honorees, a gourmet dinner, and silent and live auctions. Funds raised at the Gala will be used to support the All-American Boys Chorus’s world-class music education and leadership training programs that currently serve over one hundred boys ages 8 to 15. Boys in the program come from a wide variety of backgrounds from throughout Southern California. General Lyon started building homes for returning military personnel and others attracted to the Golden State more than 50 years ago. This modest effort evolved to become William Lyon Homes, which is now one of the nation’s largest private homebuilders. His love of flying led General Lyon to be a partner in the purchase of AirCal, and to then acquire Martin Aviation. In 2009 he established the Lyon Air Museum to preserve and promote the memory of World War II and “The Greatest Generation.” During General Lyon’s distinguished military career of more than 35 years, he flew combat missions in Korea, as well as several assignments in Europe, the Pacific, and North Africa during World War II. General Lyon received numerous awards and decorations, including the Distinguished Service Medal, Legion of Merit, the Distinguished Flying Cross, the Air Medal (with three oak clusters), and the Presidential Unit Citation. General Lyon currently serves as a director on the Segerstrom Center for the Arts Board (a former chairman of that board). He is the founding chairman of the Orangewood Children’s Foundation, and past chairman of Boy Scouts of America, Orange County Council. During 20 years as a Naval Aviator, Captain Eugene A. Cernan left his mark on history with three historic missions in space as the Pilot of Gemini IX, the Lunar Module Pilot of Apollo X, and the Commander of Apollo XVII. He also holds the distinction of being the second American to walk in space and the last man to have left his footprints on the lunar surface. Among his numerous honors are the Navy Distinguished Flying Cross, the Distinguished Service Medal with Star, the NASA Distinguished Service Medal, the FAI International Gold Medal for Space, induction into the U.S. Space Hall of Fame, enshrinement into the National Aviation Hall of Fame, Naval Aviation’s Hall of Honor and the International Aerospace Hall of Fame. Captain Cernan was awarded the 2007 Lindbergh Spirit Award. And in December 2007, The National Aeronautic Association presented Captain Cernan with one of the most prestigious aviation trophies in the world, the Wright Brothers Memorial Trophy. Captain Cernan gives his time to support many aviation-related causes and travels overseas on good-will tours for our military. Note to Editors: High-res digital images are available upon request. Interviews with the Artistic Director and choristers are also available upon request. (COSTA MESA, Calif.) – September 1, 2014 – The internationally acclaimed All American Boys Chorus invites boys 8, 9 and 10 years old to be “AABC Shadows” and experience what it’s like to be an AABC chorister on Saturday, September 13th from 8:30 am to 1:00 pm. Shadow Day is free and will take place at AABC Headquarters at the Orange County Fairgrounds in Costa Mesa. The Chorus is also performing at South Coast Plaza at the Festival of Children on Saturday, September 20th at 1:30 and 3:30 pm in the Jewel Court. Both events are the kick-off for the Chorus’s fall recruiting campaign for new members. Artistic Director Wesley Martin states that “Shadow Day and the performance at the Festival of Children are perfect showcases for interested boys and parents to see our choristers in action. These short visits might be the beginning of a wonderful journey that sees boys walk away from the AABC in a few years as fine young men, inspired with vision and determination and leadership instilled through a program of musical excellence.” AABC staff members and parents will be on hand on Shadow Day and at the Festival of Children to answer questions and provide information. To date, the AABC has released five albums and performed to standing ovations in concerts worldwide. 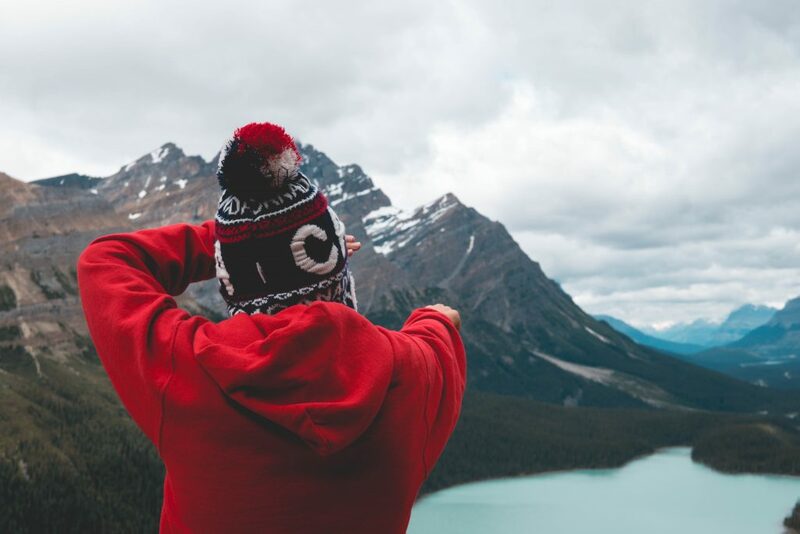 This summer the Chorus’s concert tour included performances in Washington state, and in the Canadian provinces of British Columbia and Alberta. Summer of 2013 found the Chorus touring in Australia and New Zealand. The AABC’s choristers have sung before some of the nation’s most prestigious audiences—from U.S. presidents to well-known celebrities, including Josh Groban, Tony Bennett, Paul Anka, Taylor Hicks, Bob Hope, Melissa Manchester, and Victor Borge. There have also been artistic collaborations with Disney, the Pacific Symphony, the Los Angeles Philharmonic and the Pacific Chorale. Additionally, the AABC has given its youngsters a taste of stardom; earning them television credits for nationwide commercials for Mazda, Toshiba, Cartoon Network, KFC and Pacific Life. Celebrating its 45th anniversary in 2015, the All-American Boys Chorus believes strongly in community involvement, and has performed for more than 50,000 school children in Southern California and on 50+ concert tours. For more information on the All-American Boys Chorus, call (714) 708-1670 or visit www.taabc.org. COSTA MESA, Calif.— The ALL-AMERICAN BOYS CHORUS, under the direction of Wesley Martin, will present a concert entitled YOU RAISE ME UP!, Saturday, July 12 at SOKA Performing Arts Center, 1 University Drive, Aliso Viejo. The performance is slated for 6 p.m.
Tickets are priced at $40, $36, $32 and $27 and can be purchased online or by phone at (714) 708-1670, ext 16. The All-American Boys Chorus, America’s most beloved boys choir, has delighted audiences worldwide for over forty years. Based in Costa Mesa, the Chorus is comprised of over 100 boys ages 8 – 15 drawn from throughout Southern California. Under Martin’s artistic leadership the Chorus provides boys with comprehensive musical training and unsurpassed performance and touring opportunities. The AABC is also deeply committed to community involvement, and has performed for more than 60,000 school children through its various educational outreach programs. To date, the Chorus has released five albums and has performed to standing ovations in concerts worldwide. This summer the Chorus will embark on a 24-day concert tour of the Pacific Northwest and western Canada. AABC choristers have sung before some of the nation’s most prestigious audiences—from U.S. presidents to well-known celebrities, including Josh Groban, Taylor Hicks, David Benoit, Tony Bennett, Paul Anka, Melissa Manchester, Mary Hart, Bob Hope and Victor Borge. There are also artistic collaborations with the Disney Company, Pacific Chorale, Pacific Symphony and the Los Angeles Philharmonic. Additionally, the AABC has provided its members with a taste of stardom earning them television credits for nationwide commercials for Mazda, Pacific Life, KFC, Cartoon Network and Toshiba. COSTA MESA, Calif. USA—A concert tour that has been in the planning stages for more than two years will come to far-flung fruition this August, when The All-American Boys Chorus stage a tour of Australia and New Zealand. The 30 choristers, ages 11 to 15, and eight staff members will arrive in Auckland on August 3 and finish in Sydney on August 22. During those 20 days they will visit, conduct workshops for students, and perform public concerts at schools in Auckland, Wellington and Lindesfarne in New Zealand; and in Albury, Melbourne, Hobart and Sydney in Australia. Intervening days will be devoted to sightseeing and other activities. The All-American Boys Chorus, America’s quintessential professional boys chorus, has delighted audiences worldwide for over forty years. Based in Southern California, the Chorus is comprised of over 100 boys ages 8 – 15. Under the leadership of Artistic Director Wesley Martin, a veteran of Hungary’s renowned Kodaly Institute, the Chorus provides boys with comprehensive musical training and unsurpassed performance and touring opportunities. For more information on the All-American Boys Chorus or to schedule an audition, call (714) 361-3920 or visit www.taabc.org.